Saint Polycarp - My Catholic Life! A Catholic bishop is brutally executed in Turkey. His assassin yells “Allahu Akbar,” stabs his victim repeatedly in the heart, and then cuts his head off. There are witnesses to the act. The few local priests and faithful fear for their lives. The Pope in Rome is shocked and prays for the deceased. Five thousand people attend the solemn funeral Mass. An event from long ago? No. The murdered bishop was an Italian Franciscan named Luigi Padovese, the mourning Pope was Benedict XVI, and the year was 2010. Turkey is dangerous territory for a Catholic bishop, whether he is Bishop Padovese or today’s saint, Bishop Polycarp. For over a millennium, the Anatolian Peninsula was the cradle of Eastern Christianity. That era has long since come to a close. A few hundred miles and one thousand eight hundred years separate, or perhaps unite, Bishop Padovese with Bishop Polycarp. Whether shed by the sharp knife of a modern Muslim fanatic, or spilled by a sword swung by a pagan Roman soldier, the blood still ran red from the neck of a Christian leader, puddling in the dirt of a hostile land. 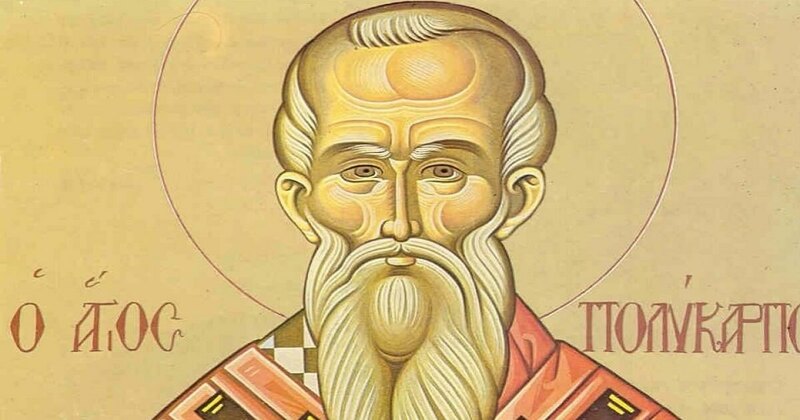 The news of the martyrdom of Saint Polycarp, Bishop of Smyrna, spread far and wide in his own time, making him as famous in the early Church as he is now. He was martyred around 155 A.D., one of the few early martyrs whose death is verified by documentation so precise that it even proves that he was executed on the exact day of his present feast—February 23. Polycarp was 86 years old when a rash of persecution broke out against the local Church. He waited patiently at a farm outside of town for his executioners to come and knock on his door. He was then brought before a Roman magistrate and ordered to reject his atheism. Imagine that. What an interesting twist! The Christian is accused of atheism by the pagan “believer.” Such was the Roman perspective. Christians were atheists because they rejected the ancient civic religion which had been believed by everyone, everywhere, and always. The Roman gods were more patriotic symbols than objects of belief. No one was martyred for believing in them. No one fought over their creeds, because there were no creeds. These gods did for Rome what flags, national hymns, and civic holidays do for a modern nation. They united it. They were universal symbols of national pride. Just as everyone stands for the national anthem, faces the flag, puts their hand over their heart, and sings the familiar words, so too did Roman citizens walk up the wide marble steps of their many-columned temples, make a petition, and then burn incense on the altar of their favorite god. It required heroic courage for Polycarp, and thousands of other early Christians, to not drop some grains of incense into a flame burning before a pagan god. For the Romans, to not burn such incense was akin to spitting on a flag. But Polycarp simply refused to renounce the truth of what he had heard as a young man from the mouth of Saint John, that a carpenter named Jesus, who had lived a few weeks to the south of Smyrna, had risen from the dead after His decomposing body had been placed in a guarded tomb. And this had happened recently, in the time of Polycarp’s own grandparents! Polycarp was proud to die for a faith he had adopted through hard-earned thought. His pedigree as a Christian leader was impeccable. He had learned the faith from one of the Lord’s very own Apostles. He had met the famous Bishop of Antioch, Saint Ignatius, when Ignatius passed through Smyrna on the way to his execution in Rome. One of Saint Ignatius’ famous seven letters is even addressed to Polycarp. Polycarp, Saint Irenaeus of Lyon tells us, even travelled to Rome to meet with the Pope over the question of the dating of Easter. 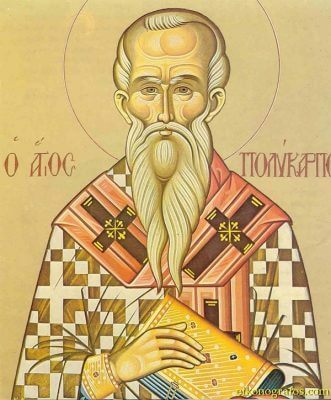 Irenaeus had known and had learned from Polycarp when Irenaeus was a child in Asia Minor. Polycarp’s own letter to the Philippians was read in churches in Asia as if it were part of Scripture, at least until the fourth century. It was this venerable, grey-haired man, the last living witness to the apostolic age, whose hands were bound behind him to a stake, and who stood “like a mighty ram” as thousands screamed for his blood. Bishop Polycarp nobly accepted what he had not actively sought. His body was burned after his death, and the faithful preserved his bones, the first instance of relics being so honored. A few years after Polycarp’s death, a man from Smyrna named Pionius was martyred for observing the martyrdom of Saint Polycarp. In just this fashion links are added, one after another, to the chain of faith which stretches through the centuries down to the present, where we now honor Saint Polycarp as if we were seated within earshot of the action in the stadium that fateful day. Great martyr Saint Polycarp, make us steadfast witnesses to the truth in word and deed, just as you witnessed to the truth in your own life and death. Through your intercession, make our commitment to our religion of long duration, a life project, enduring until our life of faith concludes with a death of faith.